We reported this past summer that Glenn Douglas Packard’s go-for-broke slasher spectacle Pitchfork premiered its first trailer at the 2016 Fantasia Film Festival. Now we have news that the film has been picked up and scheduled for release via Uncork’d Entertainment on January 13th on DVD and VOD and they’ve released an intense new trailer and stylin’ poster. Synopsis: Having recently shared a life-changing secret with his family, Hunter recruits his friends to come with him from New York to the farm where he grew up as he faces his parents for the first time. As the college students enjoy the fresh air of Michigan farm country, an older, more dangerous secret slowly emerges. While Hunter navigates a new place within his conservative family, a vicious creature from their past descends on the farm, putting the unsuspecting city kids in mortal danger. 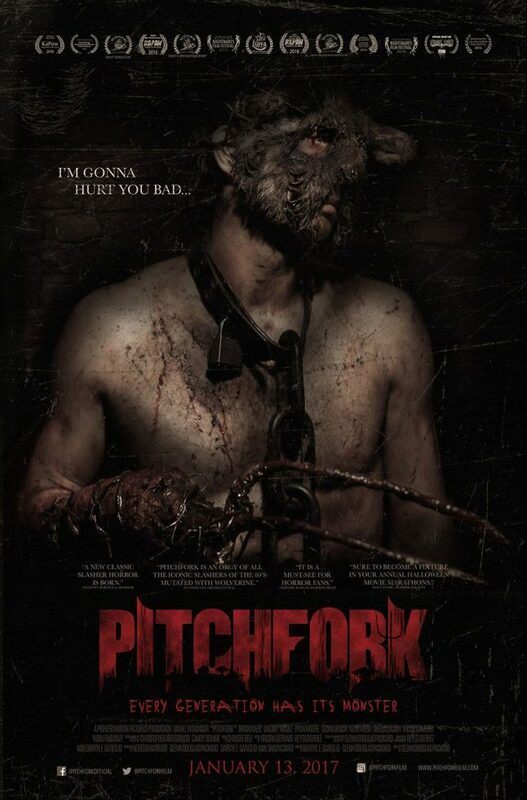 Produced by Packard, Darryl F. Gariglio and Noreen Marriott, with associate producer Shaun Cairo, and boasting a screenplay by Gariglio and Packard, Pitchfork aims to introduce its audience to a horrifying new movie monster. The ensemble cast includes Daniel Wilkinson, in the title role, with Lindsey Nicole, Brian Raetz, Ryan Moore, Celina Beach, Keith Webb, Sheila Leason, Nicole Dambro, Vibhu Raghave, Rachel Carter, Andrew Dawe-Collins, Carol Ludwick, Derek Reynolds, Addisyn Wallace and Anisbel Lopez. Feast your tired eyes on the trailer below. Is there room in your life for yet another ultra-violent slasher flick? Has this genre already been beaten to a pulp or will Pitchfork offer something new? Let us know you thoughts in the comments below!